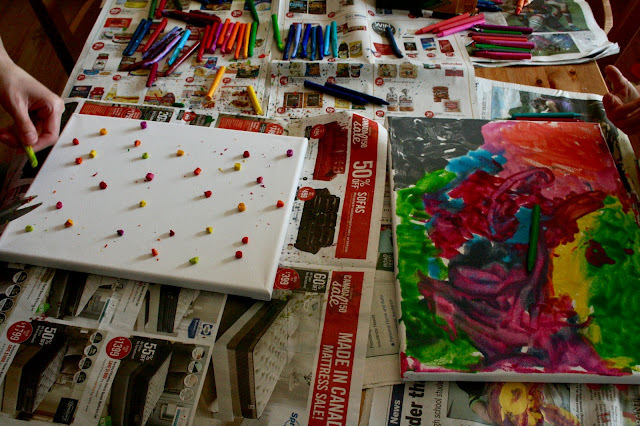 My friends and I have had a couple of melted crayon parties over at my home since the beginning of the year. 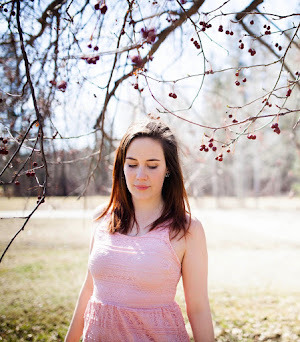 This has been something that I have wanted to do for a very long time, and when my friends also became interested in it, we went out and bought supplies right away. Creating and crafting with friends is way more fun and exciting than if I were to do it alone. 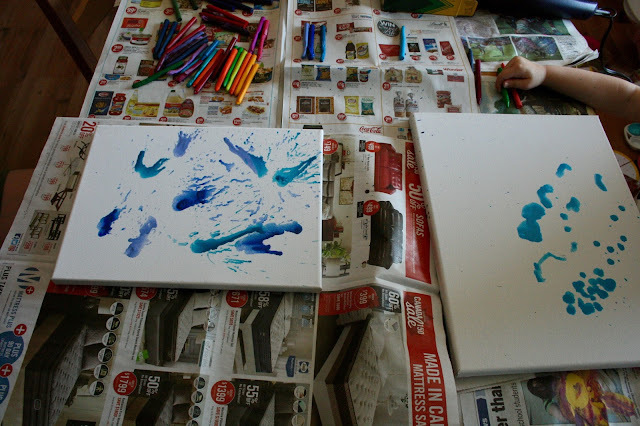 Tools Needed : Wax Crayons, Hair Dryers, Canvas, Tape and Bowls (if blocking out parts of canvas), Oven (optional), Lots of Newspaper for underneath. 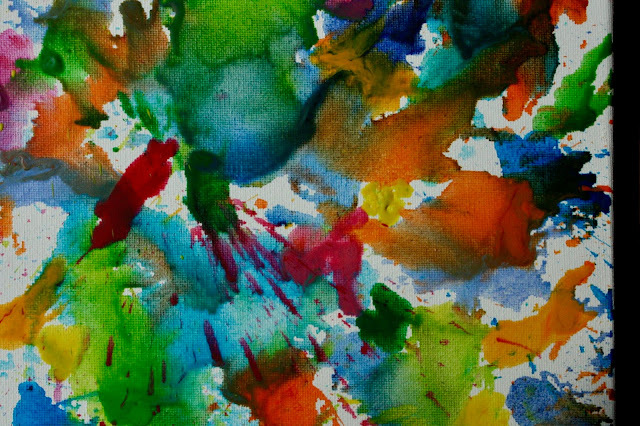 During our first melting crayon party we had all of our kids over playing together as the adults melted crayons. We also spent a long time unwrapping all of the wrappers from the crayons before we even got to the melting process. It felt a little chaotic, but we still ended up with some pieces that we were proud of. Start taking off the wrappers! so many wrappers. The photographs above are all from one friend melted crayon process and I forgot to take a photo of her finished piece. She was very happy with how it turned out though and I love her colour choice. This piece was for another friend. 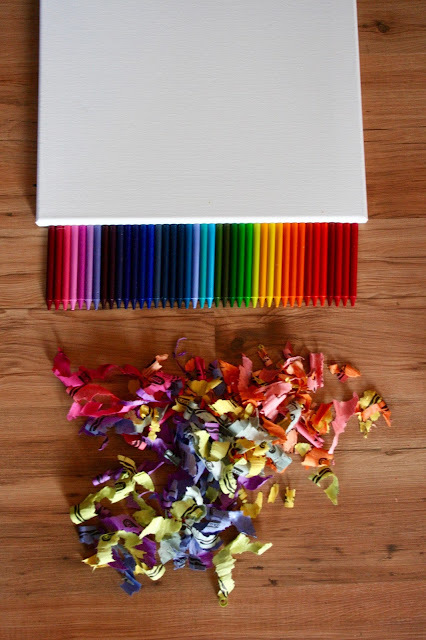 We arranged the crayons in a rainbow and taped them onto the canvas first. 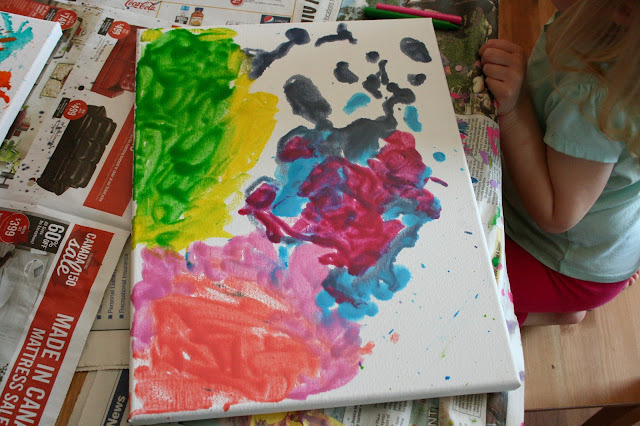 Then we realized that it would leave an awkward white spot at the top of the canvas, so we taped the crayons on another canvas and held the canvas above it. 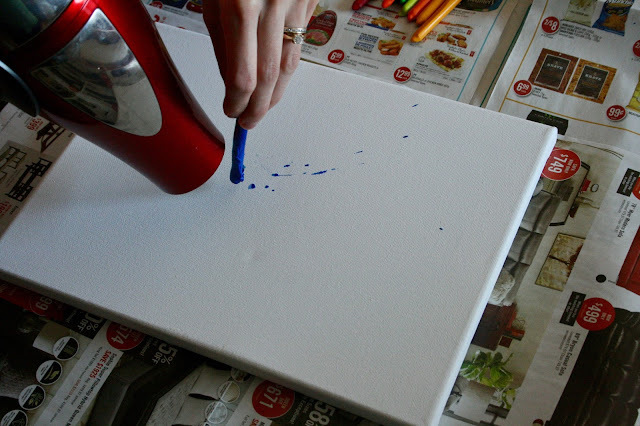 We used one of my kitchen bowls to block out a part of the canvas so that the wax would not melt onto it. 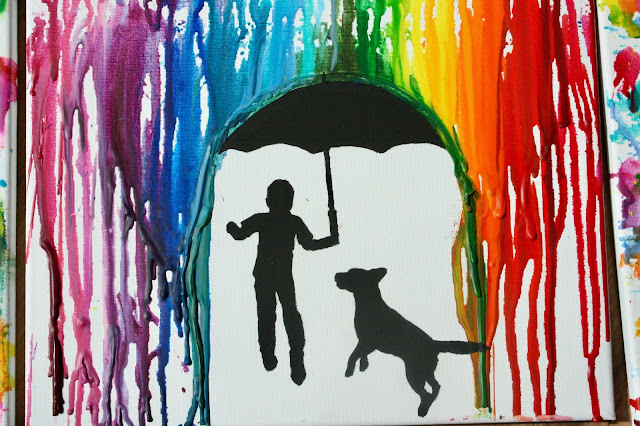 We held it there as another friend melted the rainbow. My friend knew what picture she wanted to go in the blank spot of her canvas, so I found the right size of picture and cut it out making a stencil. I drew it on the canvas before painting it black! 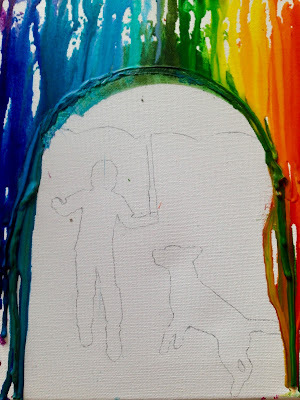 This is a tribute to her son and their dog - I love how personal it is. Second melted crayon party! 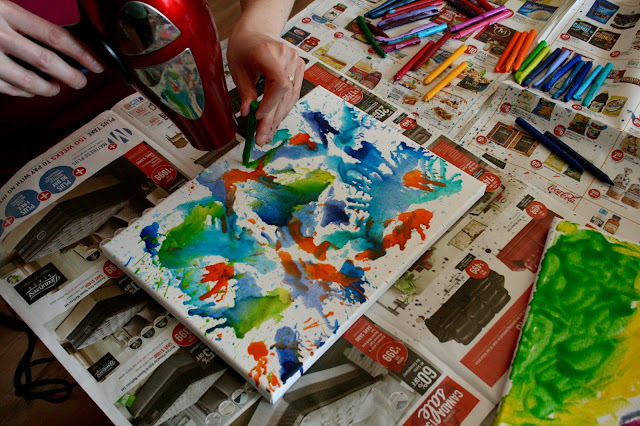 Bug joined in since no other kids came over to play and she had an absolute blast melting crayons with us. 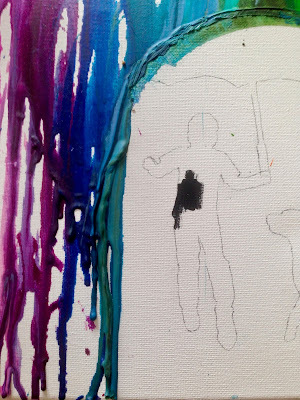 Above my friend (on the left) is melting the crayon sideways allowing the wax to splatter all over her canvas. Bug (on the right) is drawing with her crayon while I heated it up for her. 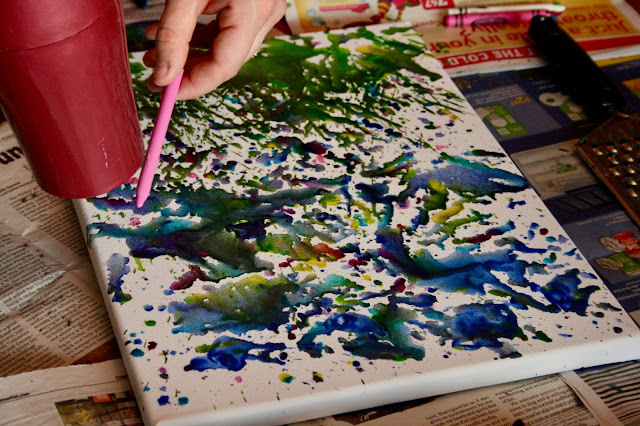 She loved how much easier it was to get the colour onto the canvas this way, but it was also a little hot for her. 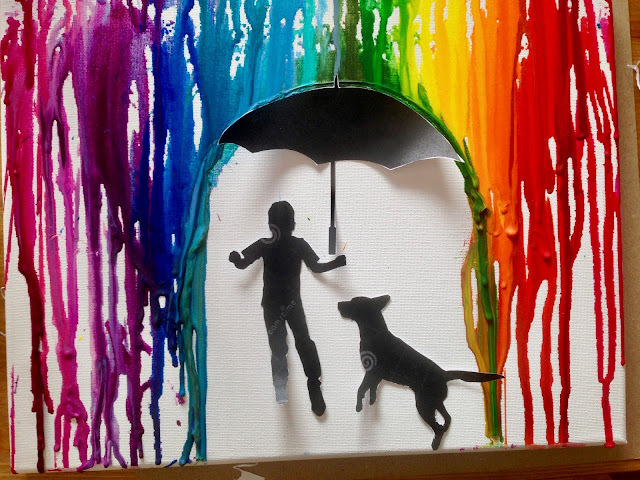 Splattering the rainbow! This piece was probably a favourite of mine that my friend did that day. 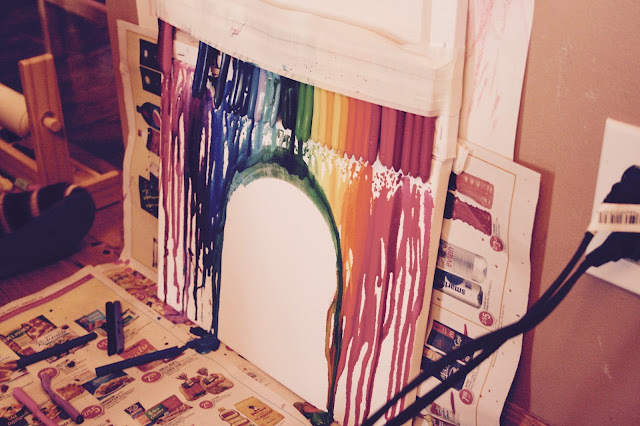 Next canvas, my friend decided to cut up some crayons and pop the whole thing into the oven for ten minutes. She wanted to stay with her rainbow theme but add a new technique. Bug is almost done her piece in this photo - she was torn between being done and adding more rainbow. Done for now! Bug is thinking about putting her name on it with a white crayon or maybe just her initials. Or maybe more colour. We are not too sure, but we will keep you posted if she adds more to it. 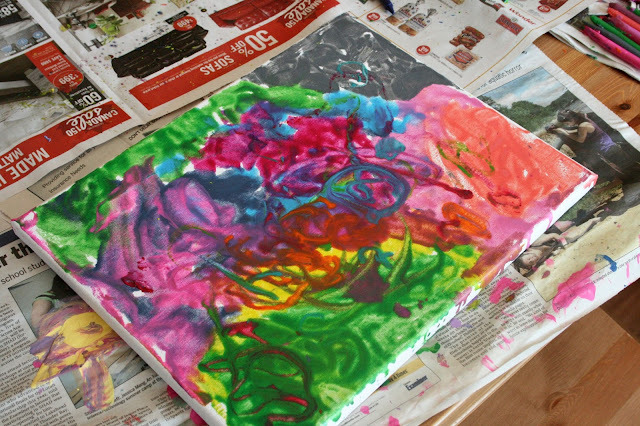 I love how hers turned out because she completely decided how to use her crayons and where, and what colours she wanted. 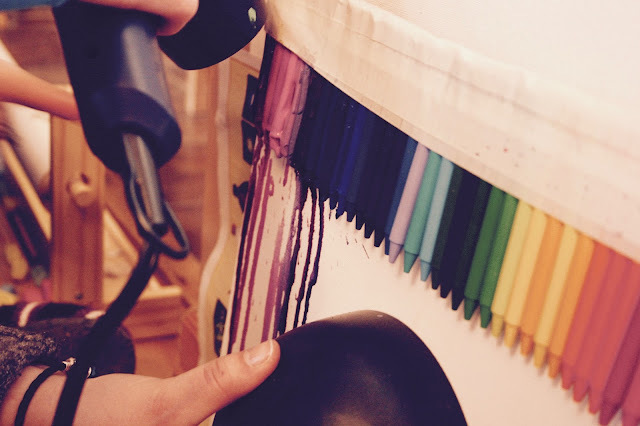 I showed her different methods, but other than the heating of the crayon itself, allowed her complete freedom. Now she is proud of her piece and cannot wait to hang it up in her room. 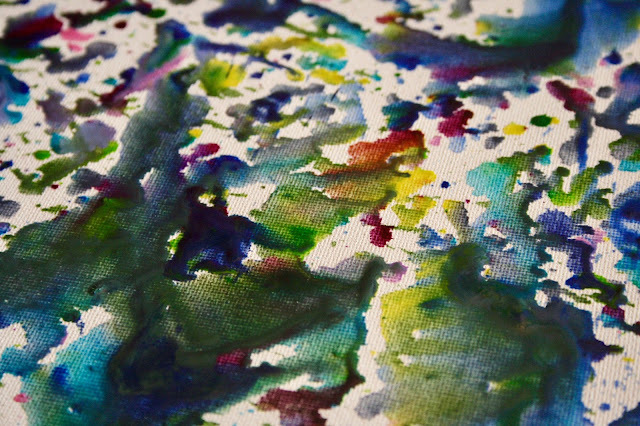 This is the melting crayons in the oven canvas close up. Using the oven we were able to create blobs of colour, however it still wasn't what we were hoping for. 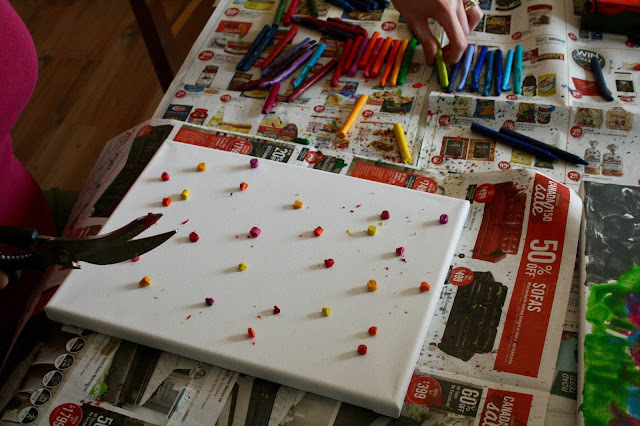 We decided to shave some crayon with a cheese grater on top and place it back into the oven. That is how we created the smaller dots amongst the big. That definitely helped bring it closer to what we were aiming for. 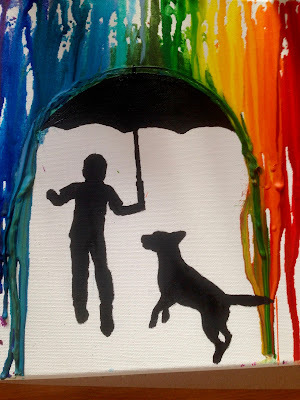 The rainbow rain canvas completed! I seriously love this piece. 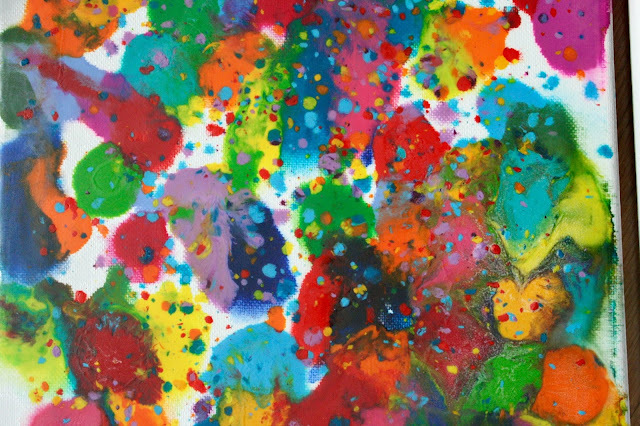 Rainbow splatters close up! 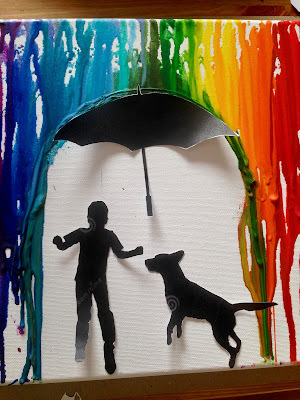 I just imagine that this is what it would look like if we jumped into rainbow puddles. The three rainbow pieces together! 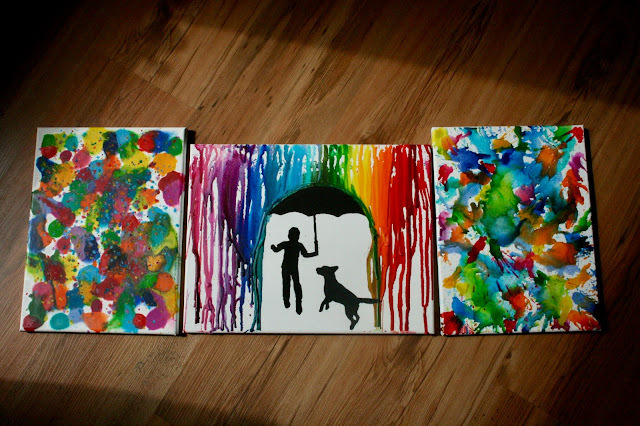 Loving the different styles - all three will be hung up together. 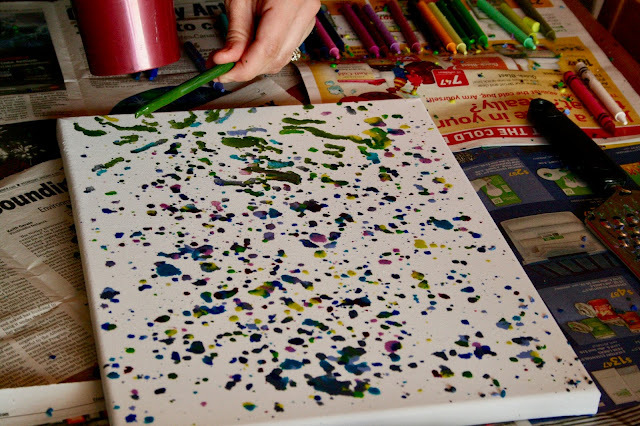 Melting crayons is such a relaxing and fun process. 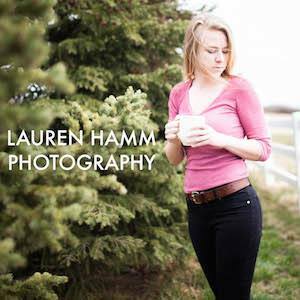 Although it can be a bit intimidating knowing where to begin, all I can say is to just start. 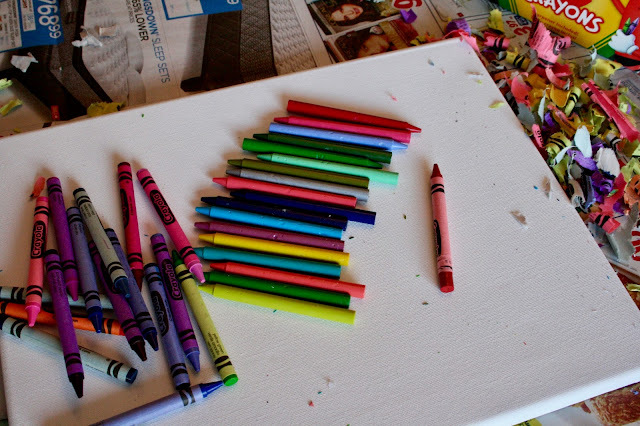 Pick some fun colours and just start. 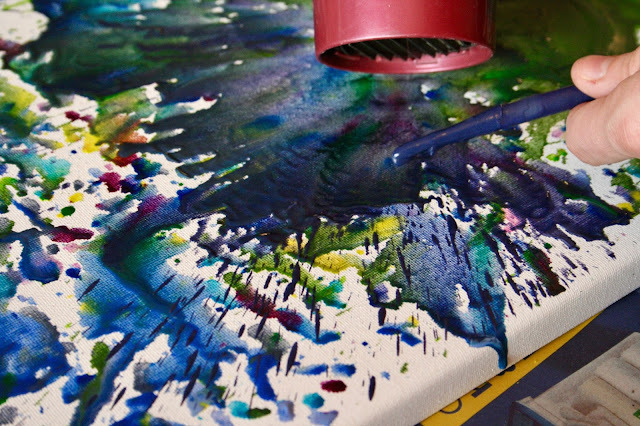 Experiment with holding the crayon or the blow dryer differently, experiment with the oven, experiment with moving the canvas while the wax is still hot. Some pieces may not end up the way you were hoping, but there is fun and freedom in that also. 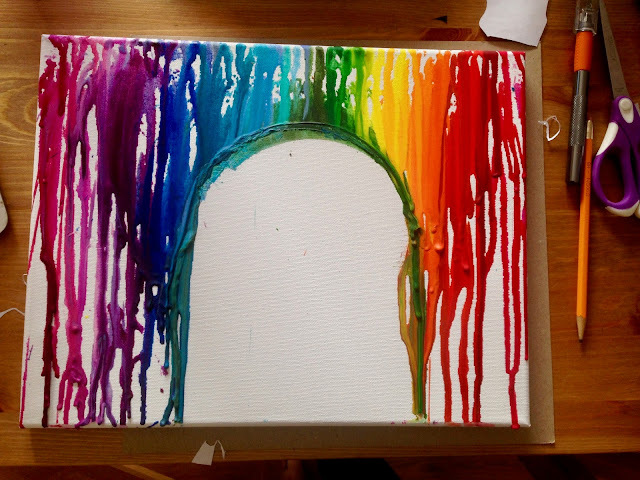 I honestly think that just seeing the crayons melt is the best part in this activity - who cares what the canvas ends up looking like. Melt, wax, melt!